Now in its fourth year of installation, the Monitoring a Shifting Earth exhibit has been visited by more than 200,000 visitors. The exhibit is located at Oregon State University’s Hatfield Marine Science Visitor Center (HMSC), adjacent to the Newport Inlet and less than a mile from the Pacific Ocean in Newport, Oregon. 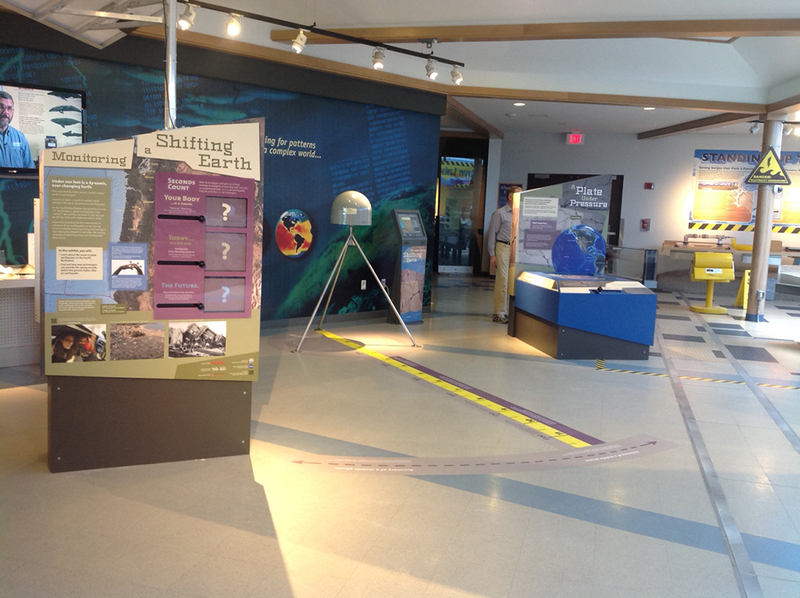 This exhibit includes six different interactive displays and raises public awareness about earthquake and tsunami hazards of the Pacific Northwest and the geodetic technologies used to measure and monitor them. 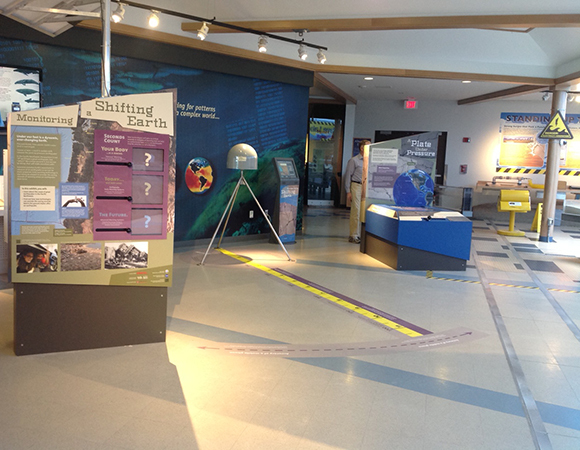 Located in the main lobby, the exhibit includes six different hands-on interactive displays. 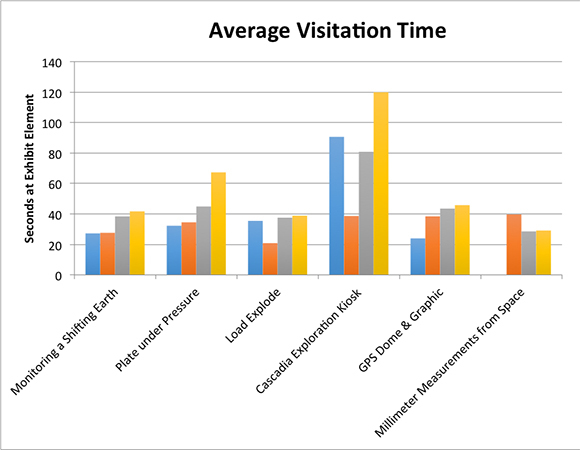 Using HMSC's NSF-funded Cyberlab automated visitor data collection system, UNAVCO conducted two rounds of evaluation to measure the visitation to the exhibit, the types of engagement, and the amount of time and the pathways taken through the exhibit. The first evaluation occured in November 2014, during one of the quietest weeks of the year, while the second round occurred in August 2015, during one of the busiest weeks of the year. The two evaluations yeilded similar results. Over 45% of visitors to HMSC engage with the UNAVCO exhibit; at least 30% interact with the exhibit for at least one minute and up to 17 minutes. Over half of the visitors are in groups. The majority of visitors are adults, at 60%, while approximately 27% are children and the remaining 11% are teens. In family groups, children typically try the exhibit’s interactive controls first, while parents, grandparents, etc. read the content and explain the process to the children. 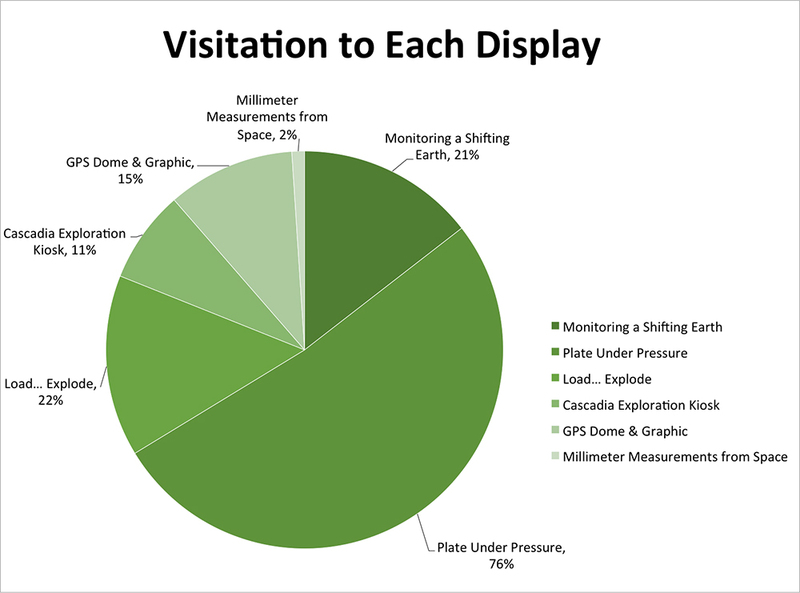 Most of the visitors engage with the same display in multiple ways by interacting with the controls, touching various parts of the display, reading the text, and / or pointing to the display. 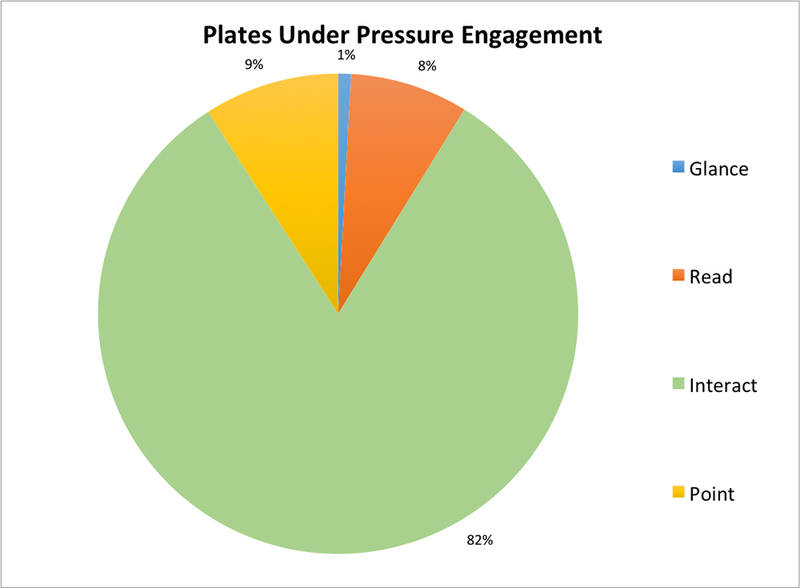 Invoking the look and feel of a pinball arcade machine, the Plate Under Pressure interactive display (Figure 1) draws the most visitors. 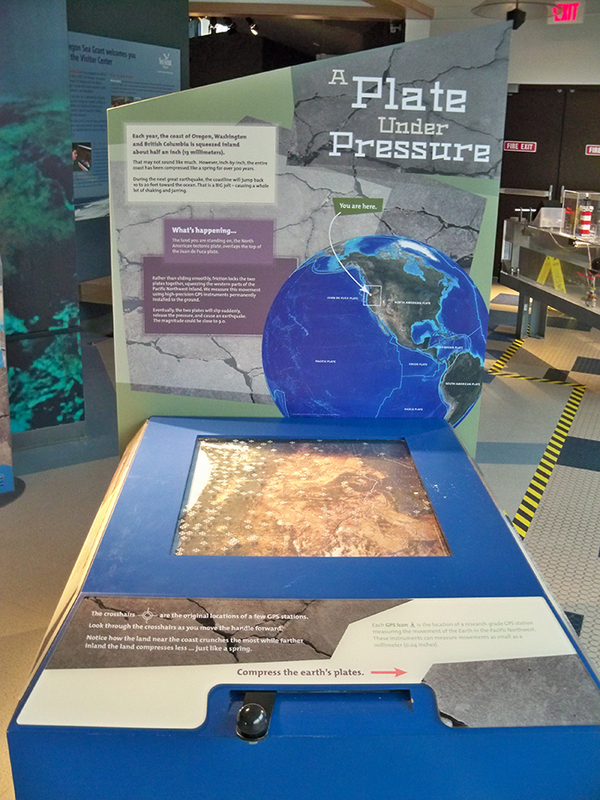 Visitors move a lever to compress a map of the Juan De Fuca plate and the Pacific Northwest to the northeast. As they interact with the map and read about the region, they discover that, similar to a compression spring, the coastal region compresses the most, further inland the land moves very little, and the eastern edge does not visibly move. Approximately 60% of UNAVCO exhibit visitors begin at this display and over 75% interact with this display during their visit. At the Monitoring a Shifting Earth display, visitors interact with “Seconds Count” to reveal information about current earthquake warning systems and how systems in the near future will work. They are introduced to the Shakeout earthquake drill and the actions to take to protect themselves during an earthquake. Nearby, a tsunami evacuation map shows the routes from HMSC to high ground. Nearly a quarter of the visitors interact with this display. In the center of the exhibit is a full-sized GPS antenna monument model. 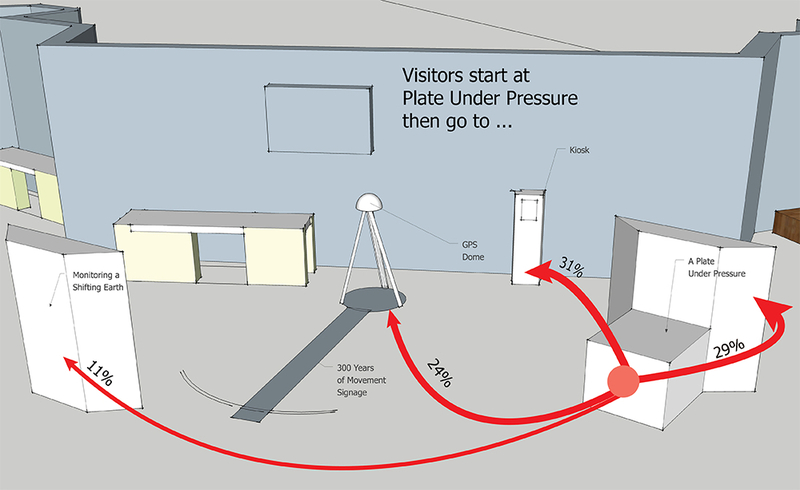 Beneath and extending away from the antenna, a floor graphic with a timeline and ruler displays the distance the region has moved since the most recent tsunami-forming earthquake of January 1700. Black dots are overlaid on the ruler to show the yearly distance that the EarthScope Plate Boundary Observatory (PBO) GPS monument located in Newport, Oregon has moved since its installation in 2000. The graphic illustrates that the Pacific Northwest coastal region has moved approximately 12 feet over the past 300 years and will move this distance to the southwest during the next subduction-zone earthquake. 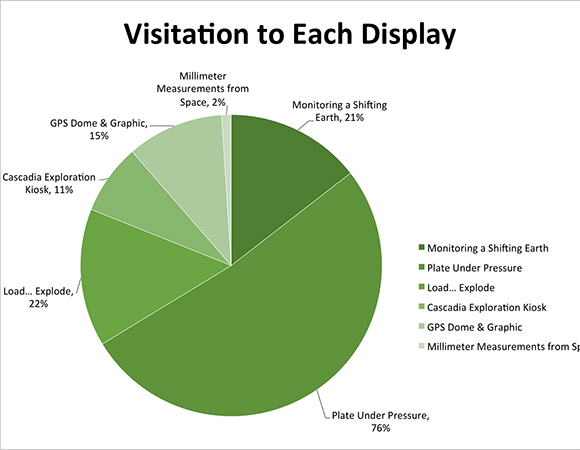 Next to the GPS antenna, Millimeter Measurements from Space showcases the PBO high-precision GPS network technologies used to measure the movement of the land with replicas of the communication equipment and solar power system. Visitors learn the role of the upgraded PBO GPS network to support real-time GPS data acquisition and provide the rapid data transfer required for current research and future earthquake early warning systems. They learn more about how GPS works and are encouraged to compare the accuracy of GPS on their smart device with the accuracy of the high-precision GPS systems used in these networks. As visitors head into the aquarium section of HMSC, they pass by the Load...Explode hands-on display of the UNAVCO exhibit. 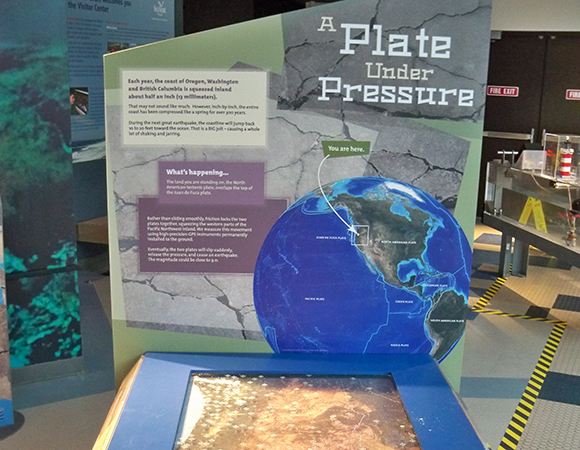 On the display, a graphic shows a side-view of the overlap of the Juan de Fuca and North American plates. Cranking a weighted handle pulls both plates downward, building stress, until a random release point is reached to create an earthquake, causing the North American plate to spring back up. Children particularly enjoy this display, spending a half-minute on average, creating multiple earthquakes. Next to the Load...Explode display is an interactive web-based kiosk: Cascadia Exploration: Danger beneath the Pacific Northwest. This content is part of the Active Earth Monitor operated by IRIS and explores the science of earthquakes, volcanoes, tsunamis, and plate tectonics of the region and the technologies used to monitor them. Visitors to this kiosk spend an average of one minute exploring the content. Visitors enter and leave the UNAVCO exhibit from multiple access points from the lobby area. 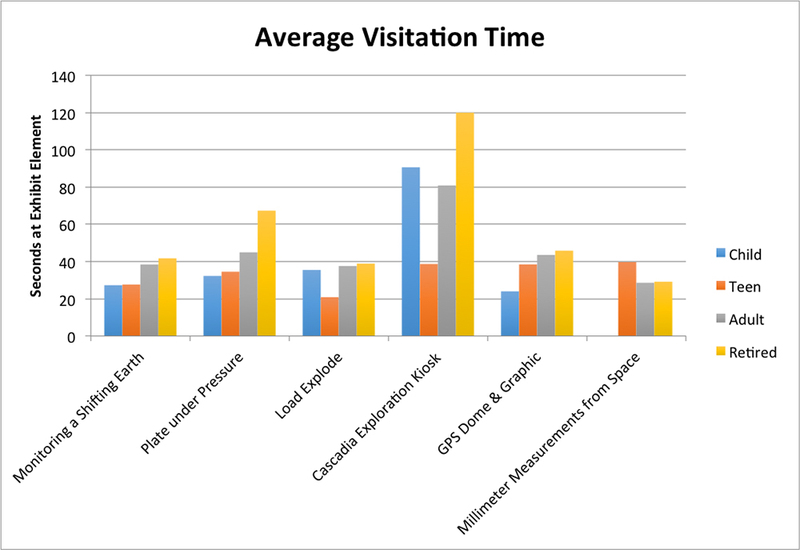 Approximately 30% of these visitors engage with two or more areas of the exhibit with some leaving to visit other exhibits and return. 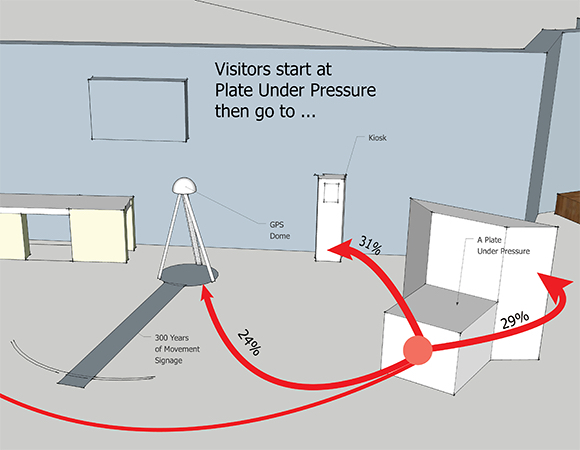 For instance, visitors who begin at Plate under Pressure, then visit the GPS dome and floor graphic. The UNAVCO exhibit complements many other exhibits in the museum which provide displays about tsunamis, the local tsunami inundation zone, and debris that traveled from Japan in the 2011 Tohoku earthquake. As a whole, these exhibits provide visitors experiences to learn about the risks of earthquakes and tsunamis and the physical compression of the land that is leading to the build up of energy. This work is based on materials provided by the UNAVCO Education and Community Engagement Program with support from the National Science Foundation (NSF) and National Aeronautics and Space Administration (NASA) under NSF Award EAR-1261833. A special thank you to Jennifer East, and Marie Kowalski, Oregon State University, for watching endless hours of video and compiling data. Research for this project conducted under OSU IRB Study ID 6881 Exempt Approval.